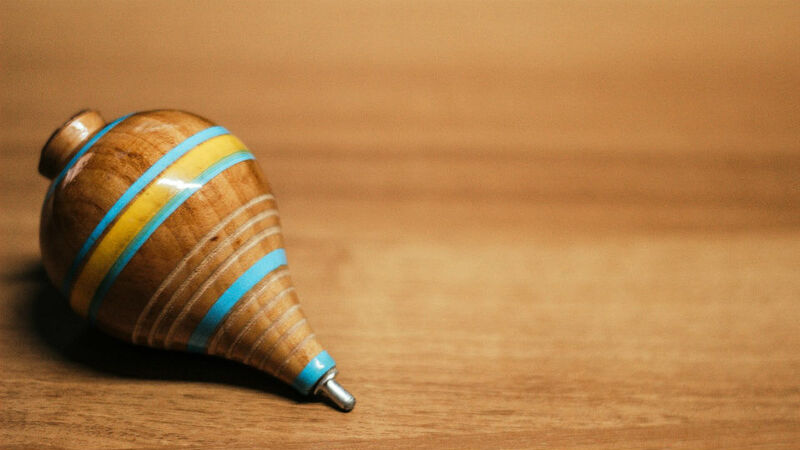 The name “spinning top” is derived from the Japanese spinning top toy, which has a body with thin extrusions on the top and bottom. Similarly, a spinning top candlestick is characterized by a small body with long upper and lower wicks. At first glance, spinning tops look similar to doji candlesticks. The key difference is that spinning tops have slightly larger bodies and longer wicks. The spinning top candlestick can be green or red. The long wicks indicate that bulls and bears were both able to push price in their respective directions during the cryptocurrency trading period. However, price returns close to the opening price before the candle closes, which suggests that neither the bulls or bears were able to push price in their favor. Like the doji, the appearance of a spinning top suggests that bulls and bears have temporarily come to a standstill. A spinning top is a neutral candlestick, and the key to using it properly lies in the context of the candlestick. If a spinning top appears after a multi-candle bullish move, it could indicate loss of momentum from the bulls and an imminent correction to the downside. Likewise, a spinning top at the bottom of a downtrend could be a sign of a trend reversal to the upside. Since a spinning top is a neutral candlestick, it’s best to combine it with other indicators such as RSI, MACD and volume when making trading decisions. A spinning top can be seen on the ETH/USD 4-hour chart below. As you can see, this spinning top appears after multiple large bullish candles are formed. The long upper wick indicates that bulls were able to push price up to USD158, but were met with heavy sell-volume from bears. As a result, the spinning top was followed by a strong bearish move to the downside. Like we said earlier, spinning tops are neutral candlesticks and the context of the candlesticks should always be considered when making trading decisions. In the examples below, multiple spinning top candlesticks can be found on the BTC/USD 4-hour chart. The spinning top highlighted by the yellow arrow appears at the top of a strong bullish trend. Similar to the previous ETH/USD example, this spinning top on the BTC/USD chart is also followed by a corrective move to the downside. However, three more spinning tops are highlighted by the pink arrows. Unlike the candlestick highlighted by the yellow arrow, these spinning tops don’t necessarily indicate a trend reversal. The spinning top on the left is in the middle of a bearish continuation, and conveys a “rest stop” for bears. The spinning top in the middle appears in the middle of a strong bullish trend, while the spinning top on the right appears to be completely neutral. Thus, it’s always important to take advantage of other indicators when making cryptocurrency trading decisions based on neutral candlesticks like spinning tops and dojis.